What About Fluoride in Drinking Water? 1.What is healthy about drinking water? Water is essential to our overall health. It keeps us hydrated, protects our joints, and helps our whole body function smoothly. Unlike juice and sugar sweetened beverages like soda and sports drinks, water has zero calories. 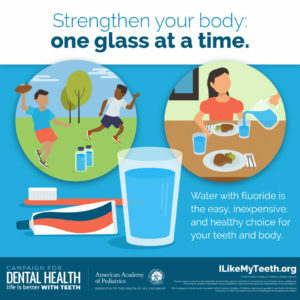 And while sugary drinks contribute to tooth decay, fluoridated water protects teeth. Sweet drinks also contribute to weight gain and are not recommended for people with diabetes. Water is an easy, inexpensive, and healthy choice. 2.Can I drink tap water? Yes. Tap water in the United States is regulated to be clean and safe. Public water systems are tested frequently, and safety results are certified. The U.S. Environmental Protection Agency (EPA), under the Safe Drinking Water Act (SDWA), regulates drinking water and sets standards to limit possible contaminants. 3.Where can I find information on the quality of my tap water? You can find information on the quality of local water supplies on the Environmental Protection Agency website. 4.What do I need to know about lead in tap water? The Environmental Protection Agency regulates drinking water for lead and, in addition to quality information on local water supplies, provides consumer information and actions you can take. The Centers for Disease Control and Prevention also provide information on their drinking water and water quality websites. Even though the U.S. has some of the safest public drinking water in the world, contamination can occur. If lead is present in a water system, it is typically caused by corrosion in the pipes between the local supply line and the tap. Scientists have concluded that adding fluoride to drinking water under established guidelines does not have any harmful health effects related to lead exposure. Bottled water is regulated by the Food and Drug Administration (FDA) which bases its regulations on the EPA standards for tap water. Additional consumer information on bottled water can be found on the Centers for Disease Control and Prevention (CDC) and the U.S. Environmental Protection Agency (EPA) websites. 6.Does my baby need water? Healthy babies do not need extra water. Breast milk and/or formula provides all the fluids they need. However, with the introduction of solid foods, water can be added to your baby’s diet. Also, a small amount of water may be needed in very hot weather, but check with your child’s doctor about how much is safe. 7.What about toddlers and preschoolers? It’s always better to give your child plain milk or water instead of soda pop, sports drinks, or fruit juice — even if it’s 100% fruit juice. Soda pop, sports drinks, and fruit juice add unneeded calories to your child’s diet and harm your child’s teeth. Healthy active living includes limiting sugary drinks. 8.How can I make sure my children are able to drink water at school? You can find out how and where your child is currently able to access water during the school day by contacting someone such as the principal, food services director, nurse or the person responsible for the local wellness policy (LWP). Many schools allow children to bring and carry refillable bottles. Federal rules and regulations require that schools participating in the National School Lunch Program make free drinking water available where lunches are served, and also at breakfast when it is served in the cafeteria. Schools that participate in the Afterschool Snack Program are also encouraged to provide drinking water when snacks are served. Many schools also provide access to water in other areas where students learn and play including classrooms, physical education areas and playgrounds. 9.What if we don’t like the taste of water? Many people add a slice of fruit, such as lemon or lime, or herbs like mint to make water tastier to drink. Adding slightly sweeter fruits like slices of orange or strawberries can be fun for kids. Carbon filters also improve the taste of water. These often come in the form of a pitcher that allows you to conveniently pour your filtered tap water and to change the filter regularly. 10.Is there fluoride in tap water? 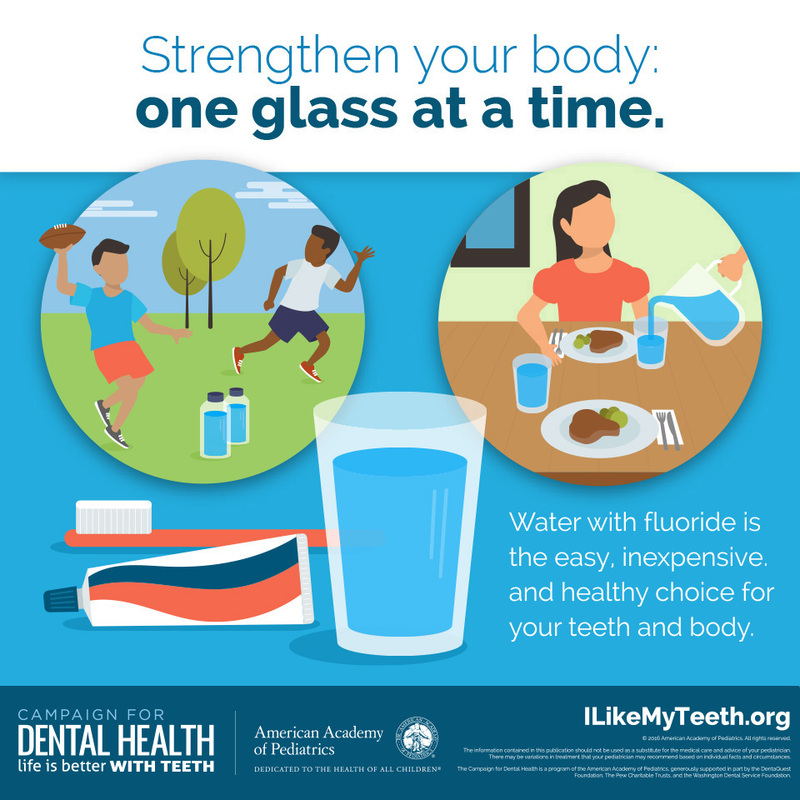 About 75% of people in the U.S. get water that has been fluoridated to the right level to prevent tooth decay. At My Water’s Fluoride, on the CDC website, you will find links to information on fluoride in local water systems. Community water fluoridation has been named one of the 10 great public health achievements of the 20th century and is supported by public health, medical and dental organizations worldwide. 11.Does bottled water have fluoride in it? Most bottled water does not have fluoride in it. If it does, it will say so on the label. Many bottled waters are filled from municipal water supplies, and some of those sources may be fluoridated. But if fluoride was not added as part of the bottling process, it will not appear on the label. To be sure, call the number on the label for more information. Families who drink bottled water could be missing the preventive benefits of fluoride in tap water. The CDC has consumer information on bottled water and fluoride on its website. A list of bottled water with fluoride can be found on the International Bottled Water Association website. 12.Is the fluoride used in drinking water regulated? Yes. The fluoride that is added to public water supplies conforms to stringent safety standards and results in water that complies with the Safe Drinking Water Act. The quality and safety of fluoride additives are ensured by NSF/ANSI Standard 60, a program that was commissioned by the U.S. Environmental Protection Agency (EPA). 13.How can I drink water without fluoride? If you prefer to drink water without fluoride, first go to My Water’s Fluoride to see if your tap water contains fluoride. Next, check your favorite bottled water. You may need to call the number on the label for detailed information. Finally, reverse osmosis filter systems are known to remove fluoride. Consider that drinking water without fluoride does not protect your teeth.